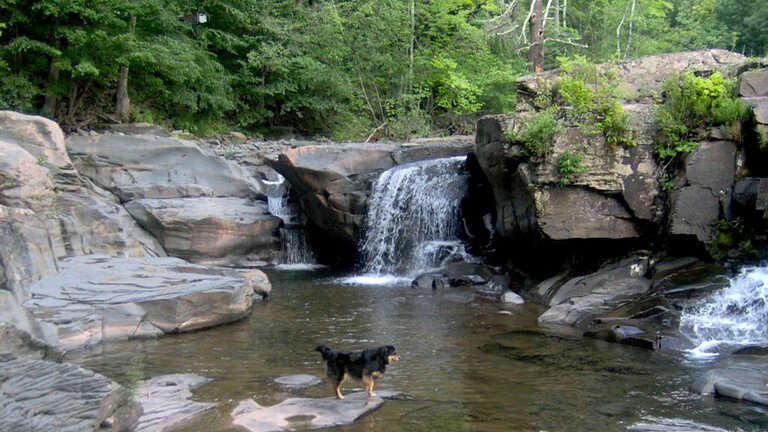 This picturesque cottage is perched on the stunning Kaaterskill Creek with the Niobe Falls in the back yard giving access to beautiful swimming holes. 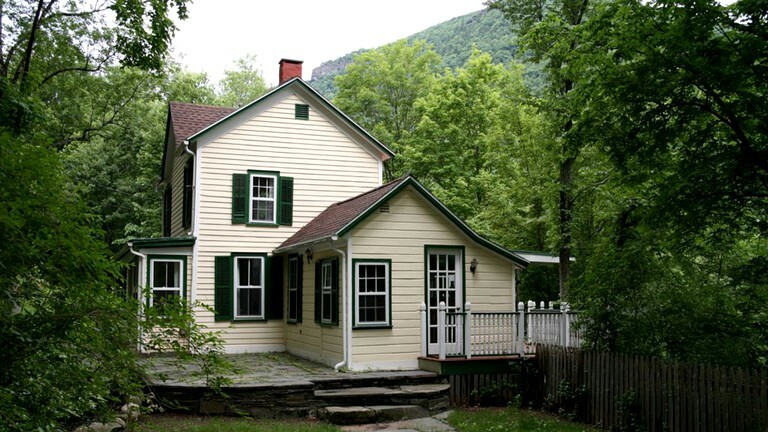 The property is surrounded by trees and provides magnificent views of the Catskill Mountains. 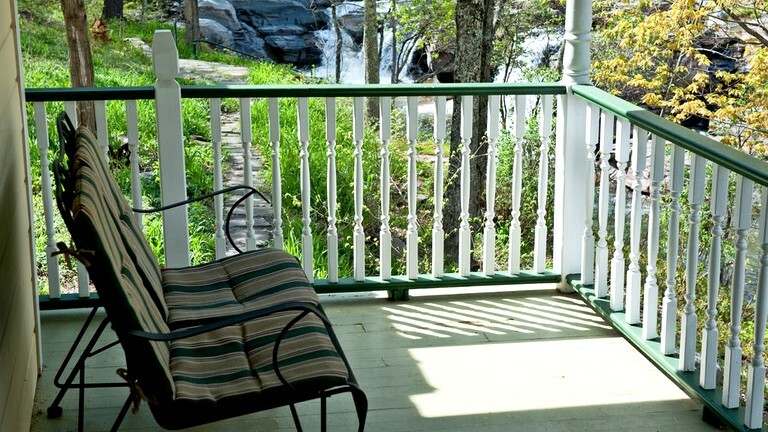 The cottage can accommodate up to six guests and consists of three bedrooms. The first bedroom has a queen bed and the second is furnished with a double bed and a sleeper sofa. Both of these bedrooms each come with their own full bathroom. The den provides a third bedroom with two convertible twin beds and a Yamaha electric keyboard. 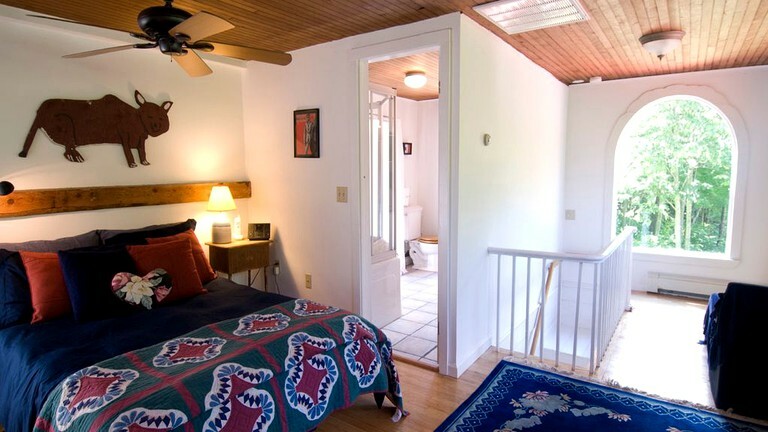 This bedroom has access to a shared bathroom. 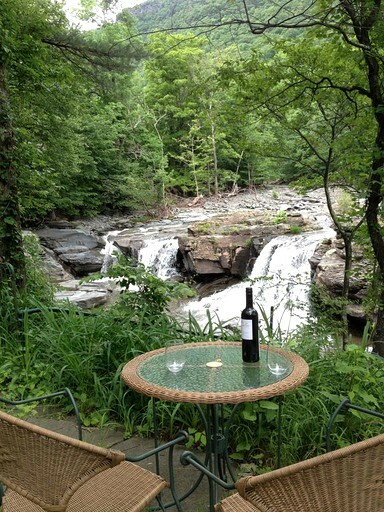 The living room offers additional sleeping space if necessary, with a queen sleeper sofa with a specially designed mattress pad and excellent views of the waterfall. The living room also includes comfortable seating space, a gas fireplace, and a 42-inch flat panel HDTV with HBO and Showtime. Guests can choose from the extensive collection of over 60 DVDs to enjoy a cozy movie night. As well as the internet, there is a telephone so guests can make free long distance calls. 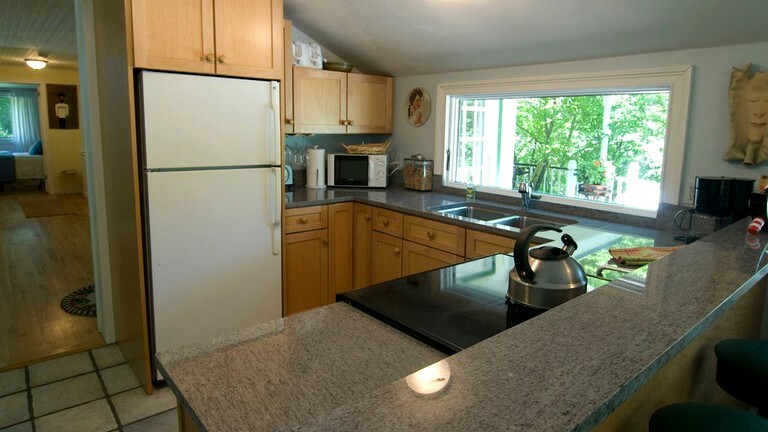 The accommodation provides a fully equipped kitchen complete with a refrigerator, an oven, a stove, a toaster, a microwave, a freezer, a coffee maker and a grinder, and a blender. Guests will also find dishes, cooking utensils, and basic pantry items. 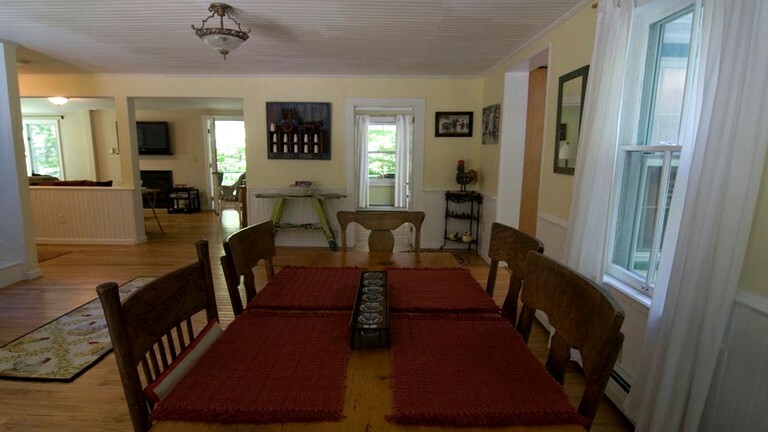 A delicious home cooked meal can be shared around the spacious six-person dining table. 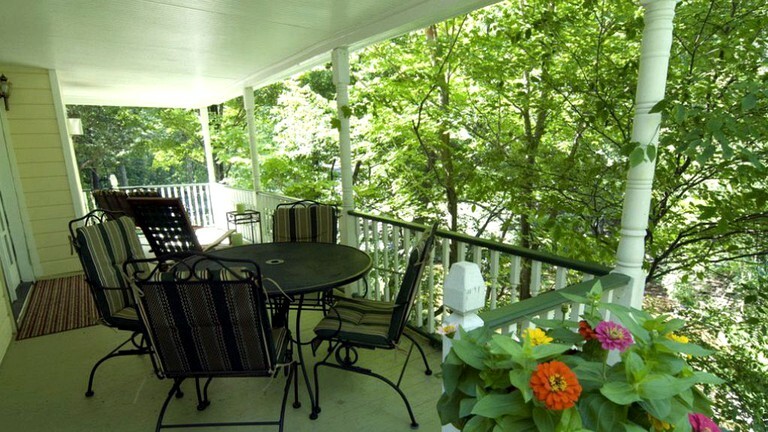 Guests can dine al fresco on the veranda which is furnished with a table and chairs. Outside, guests can also relax on the covered wraparound porch or in the backyard that is fenced in, which is great for children and dogs. In addition to this, there is an outdoor gas grill so guests can prepare a barbecue in the summer. This property offers free Wi-Fi, as well as air conditioning, ceiling fans, and heating. Guests will also find a washing machine, laundry detergent, and a clothes dryer. The cabin offers bicycles for guests to use, which can be found in the basement. Outdoors, guests will find a gas grill to rustle up a tasty barbecue. 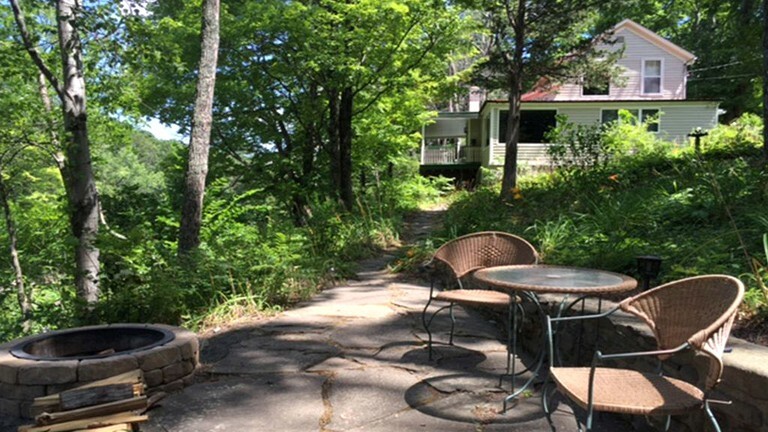 The cabin offers plenty of off-street parking space for guests bringing their own vehicles. There is a catering service available to guests, where a local personal chef can prepare a delicious home cooked meal to give guests a true luxury treatment. The host requires a 48-hour notice period for catering and the service incurs an additional charge. This property is excellently located within close reach to a host of fun activities for every type of person. 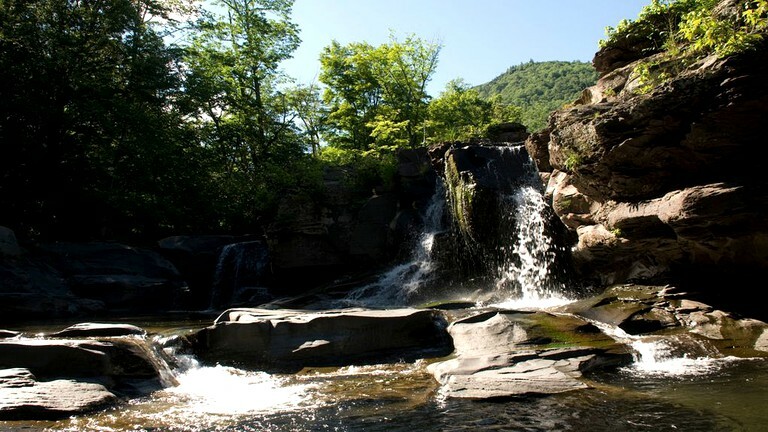 A must-do visit while staying here is the breathtaking Kaaterskill Falls, which also offers a steep two-mile trail for hiking enthusiasts. This is a great opportunity for capturing some stunning photographs or stopping for a scenic picnic. The nearby area hosts a variety of different seasonal events such as the Jazz Festival, the Garlic Festival, and the famous Woodstock Film Festival. This is a great spot for golf lovers, with the Rip Van Winkle Golf Club offering a nine-hole course just under five minutes away. Additionally, the 18-hole Catskill Golf Course is located 10 miles away and the Woodstock Golf Course is 12 miles away. During the winter, guests can access the popular Hunter Mountain ski resort in just 10 miles for some excellent slopes to enjoy skiing, snowboarding, or snow tubing. 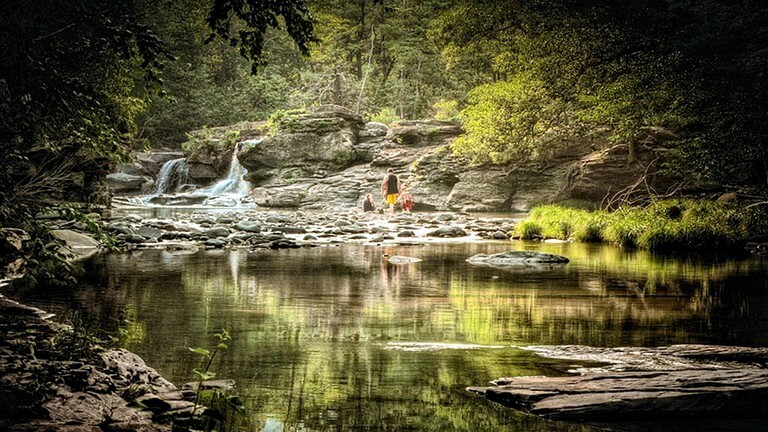 Hunter mountain is not only a great ski resort but also offers many activities during the warmer months. 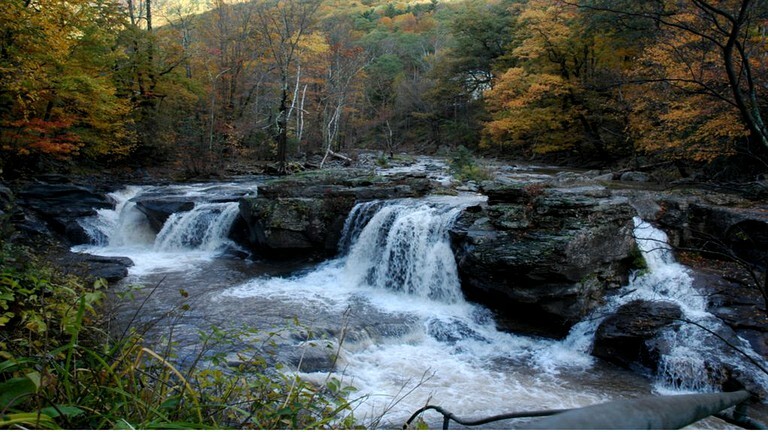 Guests can enjoy a scenic sky ride, zip lining, fly fishing, hiking, and various fun festivals throughout the year. The nearby village of Saugerties is just 10 miles from the property and is home to some great shops, restaurants, markets, galleries, and the H.I.T.S equestrian show for horse lovers. Guests don't have to travel far to eat out as the Palenville area offers the Fernwood Restaurant, the Circle W Market, and the Pippy's Hot Dog Truck for a tasty bite! 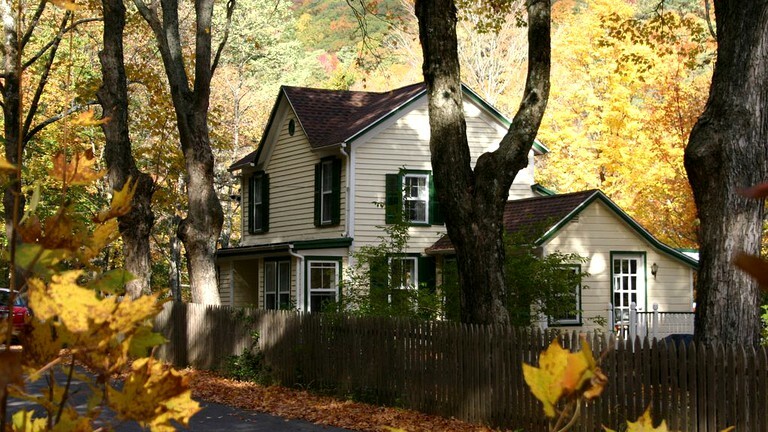 Other places to dine out include Tannersville, Woodstock, Hyde Park, and Uptown Kingston. Smoking is not permitted inside the cabin; however, guests may smoke on the grounds. Well-behaved dogs are welcome on the property for an additional fee. There are feeding bowls, a dog bed, and clean-up bags available. Guests should note that there is an additional damage deposit fee of $350.